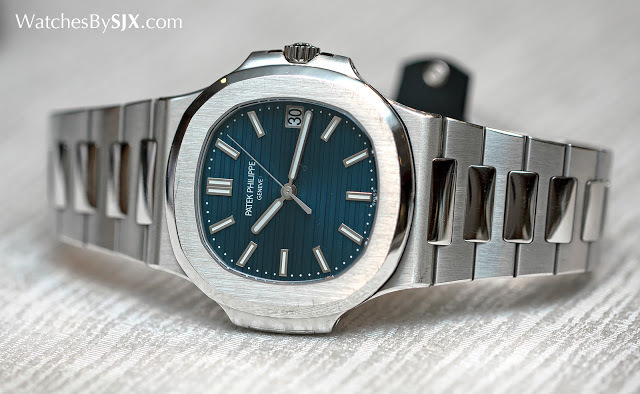 Introduced some time in 2013 but not listed in the Patek Philippe catalogue, the Nautilus ref. 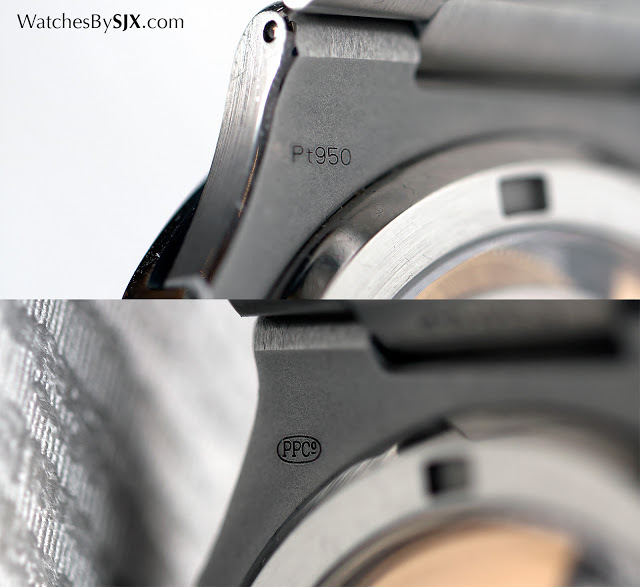 5711/1P is not especially well known and almost impossible to see in the metal. The platinum Nautilus essentially a precious metal version of the classic ref. 5711/1A – and it costs five times as much – the modern remake of the original Nautilus “Jumbo”, but with a few minor tweaks to distinguish it. One specimen of the ref. 5711/1P will go under the hammer at Phillips’ Hong Kong auction in December, an uncommon opportunity to see a special watch. 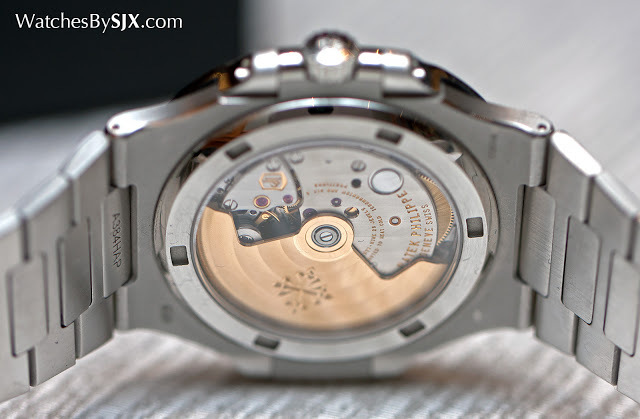 The most obvious difference is its weight – the platinum Nautilus is exceptionally hefty. 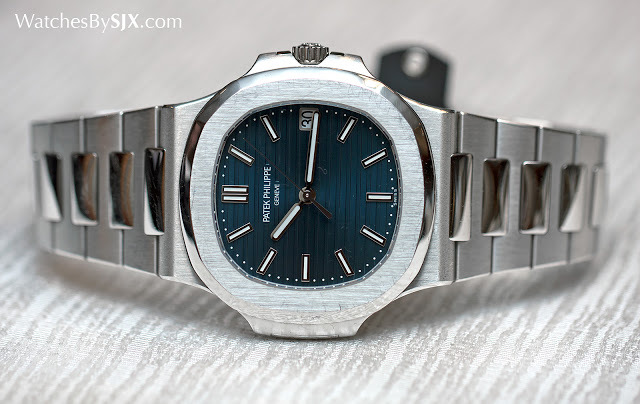 Using the relative densities of platinum and stainless steel as a guide, the platinum Nautilus should be almost three times as heavy as the steel version. The rose gold Nautilus introduced earlier in 2015 does give the platinum model a run for its money though. Though both dials share the same trademark horizontal guilloche, the dial of the platinum model is an entirely different shade of blue. While the steel version is a graduated grey-blue that darkens towards the edge of the dial, the platinum model is a bright, vivid blue. 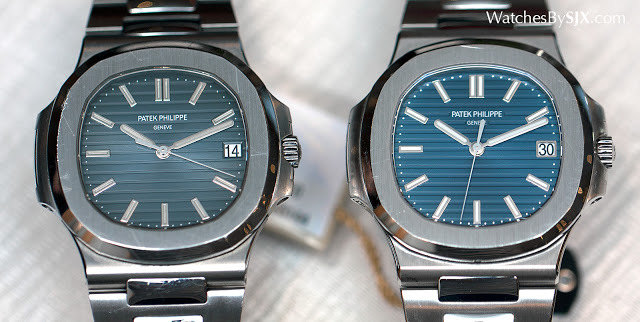 Other differences in the dial are more subtle, like the white gold frame around the date window on the platinum model that’s absent on the steel Nautilus. Most interesting is the logo printed at 12 o’clock. 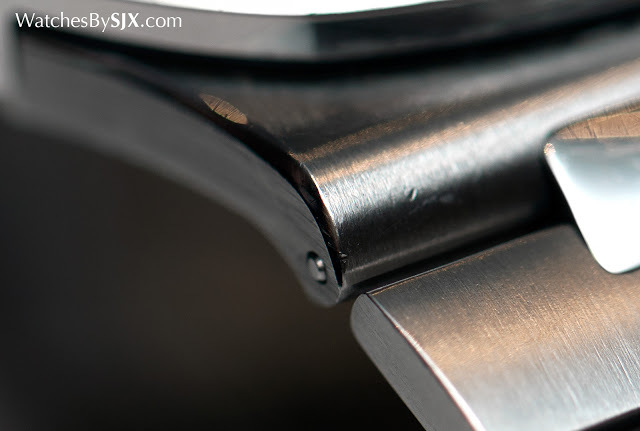 While the steel model has the lettering printed on the horizontal fluting, the guilloche of the platinum Nautilus leaves a flat recess to accommodate the logo. 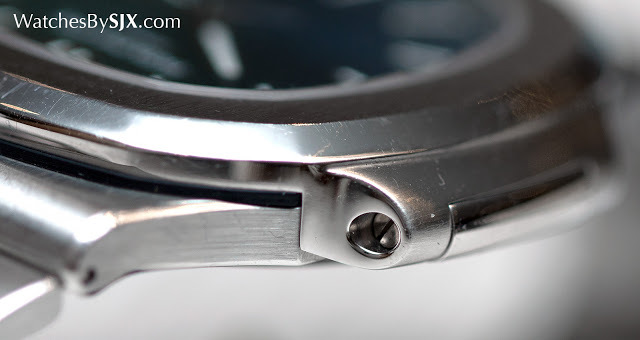 A tiny detail but one that illustrates the extra effort that goes into the watch, something that’s entirely appropriate given how extraordinarily expensive it is. 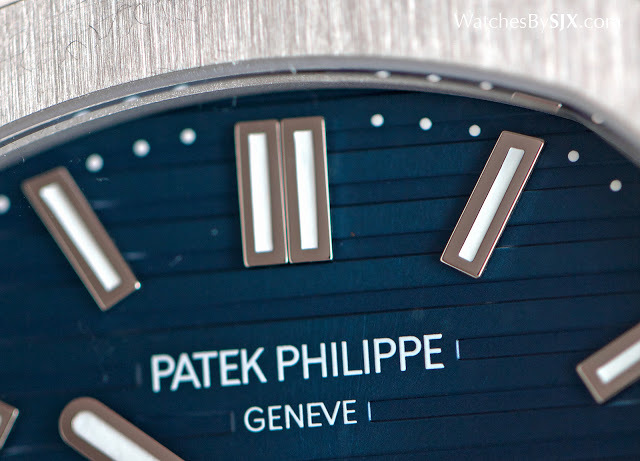 Like all platinum Patek Philippe watches, the 5711/1P has a tiny diamond set into the bezel at six o’clock. But beyond the minuscule gem, the case and bracelet are also subtly different. 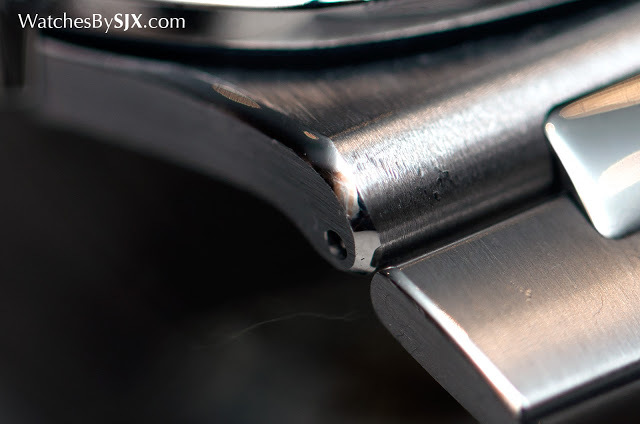 The polished bevels on the edges of the case and bracelet links are more prominent on the platinum than on the steel, making it more attractive. 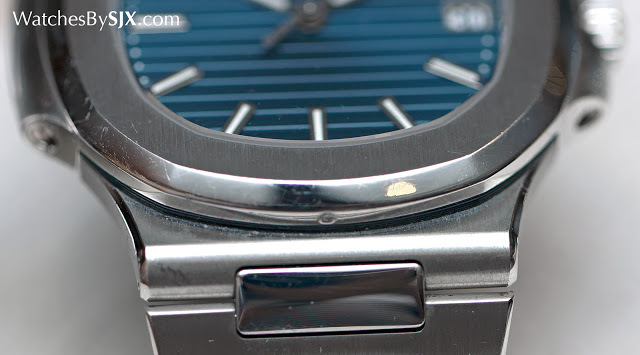 And of course the platinum Nautilus features a prominent hallmark on the back. Watches like this are entirely about bragging rights, made desirable by rarity and price. 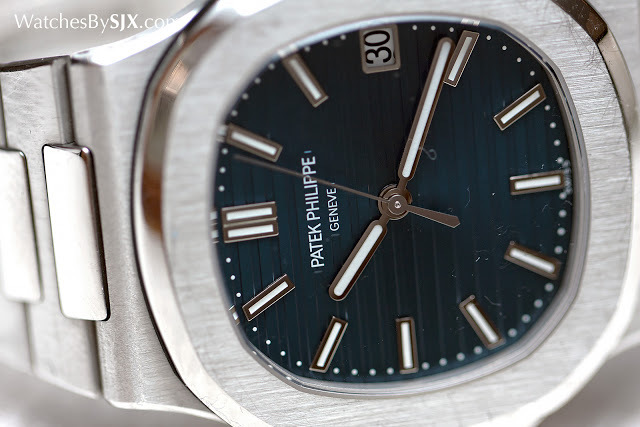 After all, it is supposed to be offered only to the very best of Patek Philippe’s clients. The Nautilus ref. 5711/1P retails for approximately US$90,000, a sum that’s ridiculous both absolutely and relatively, but small change to the firm’s top spenders. And the scarcity of this watch means the price is wholly acceptable to the fortunate few who qualify for such a watch. On the secondary market it is apparently even more stupendously expensive, with an estimate of HK$850,000 to HK$2 million, that’s US$100,000 to US$250,000. The platinum Nautilus is lot 341 from the upcoming Phillips The Hong Kong Watch Auction: One (we recently covered ten highlights from the sale) that will take place in Hong Kong on December 1, 2015 – see the full catalogue here.